Last week we received a very exciting email telling us that we had made it through to the next stage of applications for the Bigjigs Play Patrol. We love wooden toys in our house and Bigjigs make a few of our favourites so the opportunity for Bud and Little Miss to join their team of tiny testers is very exciting! 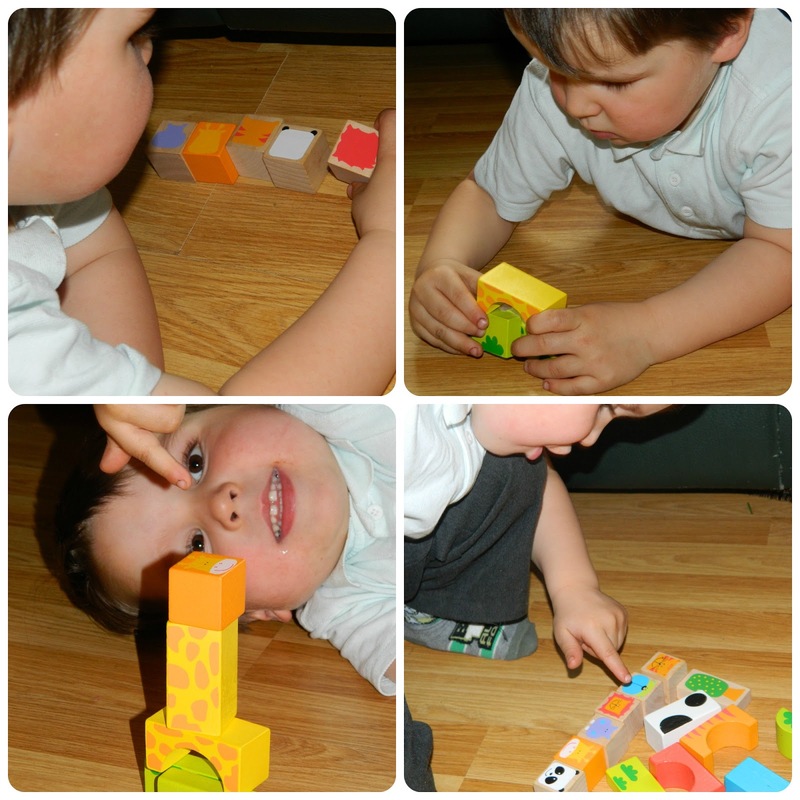 We were set our first challenge and were sent a set of Wooden Safari Animal Building Blocks. These are a set of printed blocks comprising 32 pieces in five different shapes. So far so good. What sets them apart from standard blocks is the detailed printing which means that they can be used to build a safari scene. 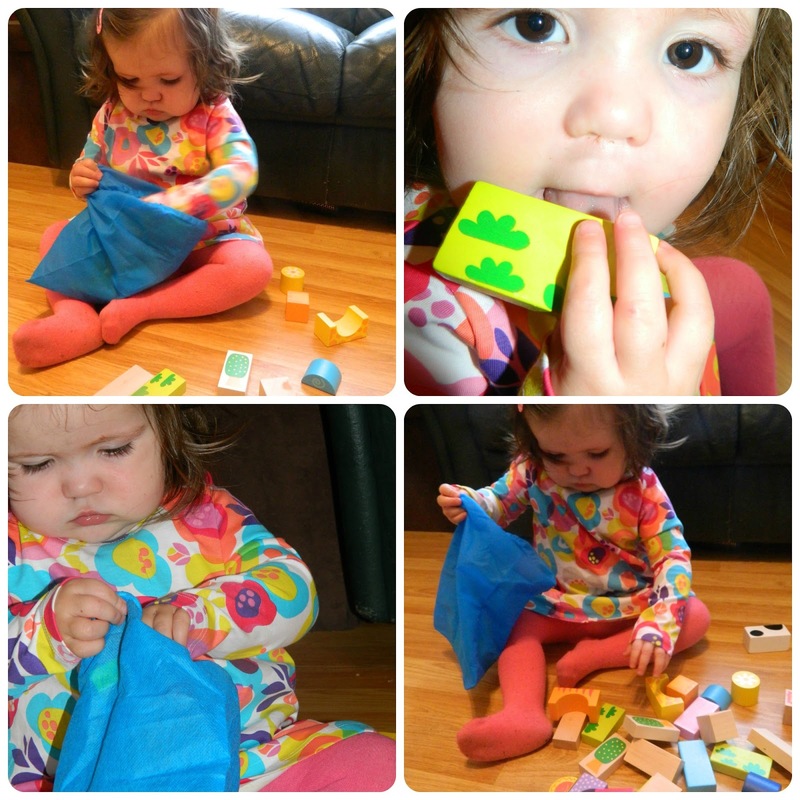 From Mum's point of view I love that they are, as usual from Bigjigs, made from high quality, responsibly sourced materials and that, brilliantly, the set includes a cloth bag to store all of the blocks together. I've lost count of the toys we have had which are made up of a few component parts which can't be effectively stored once the box is opened. A bag solves this issue and I'm so glad Bigjigs thought of it and included it. 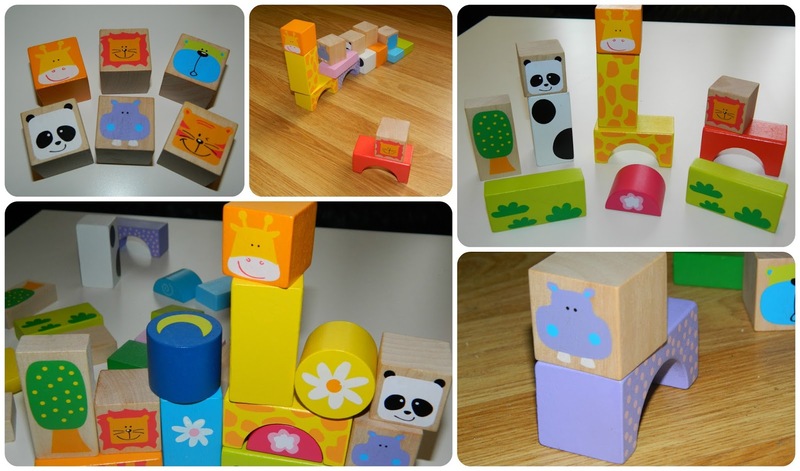 The blocks are well made and have already been thrown around on our wooden floors rather a lot. I haven't seen any damage, or likelihood of it yet, no risk of sharp edges or corners here. They are excellent quality. Anyway, enough of the boring bit. Let's find out what Bud and Little Miss thought of it. Learning through play is at the heart of our home so thought I would show exactly how children can learn while having lots of fun with these blocks. First up, Little Miss. This set is aimed at children aged one upwards so she is the perfect age, at almost twenty months to get to grips with this set. She was very interested in them as soon as she saw them and I couldn't open the packaging (virtually all recyclable, good work Bigjigs) quickly enough for her. From there on she watched as I showed her all of the different shapes before heading off to start exploring them herself. The fact that the blocks are brightly coloured means that LM found them really engaging. She loved the blocks with faces on and pointed to their eyes and mouths. This is something we are working on with her at the moment ('LM, where are your eyes?' etc) so having six new different animal faces to try this out on was great. Another thing she is rather keen on is animal noises so the lion and tiger were met with a 'rarrr' from her. LM loves to build so she had fun stacking the blocks but also got very frustrated when they fell over. It's very interesting to watch her puzzle out how to make the tower more stable and this saw her using two hands, one to hold the blocks lower in the tower and one to add another. Something she found hilarious was trying to add the circular, and semi-circular blocks to the tower. She did this using the flat edges first then tried the rounded edges and found it very funny when they rolled straight off. Another interesting thing was the movement of the blocks. Little Miss loves to drop them and listen to the sound they make as they hit the floor. I think both of these examples are allowing her to explore cause and effect and for her to develop her sense of how she can interact with her surroundings nicely. Bud next. I was surprised by how interested he was in the blocks as soon as he saw them. He is truly mad about animals so I suspected the theme of the pack would appeal to him. I was right. He immediately identified all of the animals and began to talk about what they looked like and how to build their bodies. He was very keen on making sure each animal had the correctly coloured blocks to make it look just right. Bud was completely fascinated by the blocks having a 'back of the head' on them, as well as a face and he spent a good amount of time making me 'guess' which each animal was without me seeing it's face. Bud is really starting to grasp numbers well recently, he can count ably but is starting to understand simple addition and subtraction and we used the animal head square blocks to do a little of this. I asked him how many big cats there were and how many of the animals weren't big cats and he was able to split them into simple groups and count the two groups as part of the whole. The set includes a moon and a sun which is really handy to use to talk about the passage of time with young children. Bud got to grips with this quite quickly and said 'when the moon is out the animals are sleeping' and 'when I pick up the sun the moon goes to bed and it is morning time.' The main way Bud has played with them is to tell stories about the zoo or jungle he has created and explain what is happening to the animals to whoever is around. He is increasingly taking on the role of 'expert or teacher' at the moment and will constantly ask adults questions, saying 'no, that's not right, try again' if we answer incorrectly or praising by saying 'well done Mummy' if I answer right. As he is something of an animal expert these blocks lent themselves well to this type of play too, 'which of these animals eat meat Mummy, which of them eat leaves and grass' etc. I tried a couple of simple memory games with Bud too. We put the six animal faces out and I covered them over and removed one and he had to guess which one was missing. These blocks have really got me thinking about the power of simple blocks and just how much my children can actually learn from them. We always have them in the toy box and they get used in a myriad of ways, as musical instruments when LM is banging them together, as rubble for Bud's dumper trucks, as construction material, as scenery for a train set. The fact that these blocks are so beautifully decorated and lend themselves so brilliantly to imaginative play and story telling is an added bonus. We made a little video so you can see the blocks in action. So, in summary, besides being a lot of fun, how do the Bigjigs Wooden Animal Safari Building Blocks help children to learn through play? Object permanence - understanding that the blocks are still there even though they can't see them. 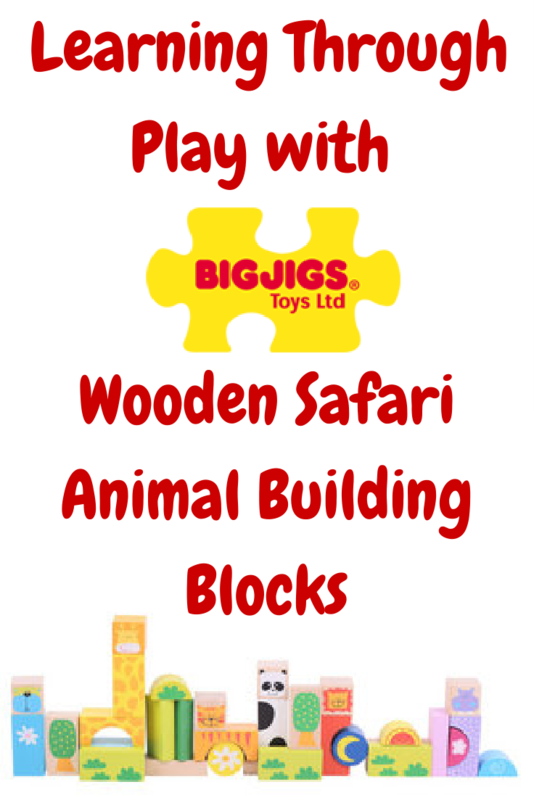 You can buy the Wooden Safari Animal Building Blocks from Bigjigs and find them on Facebook and Twitter for lots of fun and all of their latest toy news. Disclosure: We received the blocks as part of our application to join the Bigjigs Play Patrol, all opinions are my own.